Terrence Brown is currently a photo/layout editor on C-SC Newspaper staff. Terrence is a third-year student, majoring in sports management and minoring in human performance spec. He is from the blues city Memphis, Tennessee where he has three brothers and one sister. 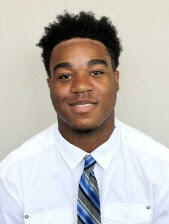 Terrence is a football player here at C-SC and his position on the field is Wide-Receiver. He has been playing football ever since he was five years old. This past summer he hiked the tallest mountain in Southern California called San Jacinto Peak which is 10,834 feet. This was his first time ever hiking a mountain. He is a nice person and loves to meet new people so please if you do see him speak!